We're still trying to determine the exploit's exact timeline and details, but it appears as though it was ended (by the hacker) on January 30, 2013. As with Facebook, it's important to stress that we have no reason to believe user data was compromised. Eric Romang has done some additional detective work on the the attack, laying much of the blame on Java itself. Last month, Apple twice blocked Java 7 from working on users' Macs, perhaps after the company discovered that its own machines had been compromised. * URL to blog post: http://iphonedevsdk.com/forum/site-news-announcements/111889-iphonedevsdk-compromised-what-happened-and-how-we-are-dealing-with-it.html -- We've avoiding linking it due to the recent hack at that site. and THIS is why "noscript" is mandatory on all of my company's computers. So lots and lots of big giant companies were hacked. It was the fault of some third party. But all we hear about is that Apple was hacked! Apple has lousy security! Anybody who owns any Apple anything is in SERIOUS DANGER! Run for the hills, but only after destroying all Apple products! Typical. Apple is just the whipping boy of the mainstream media. They go into a frenzy and let everybody else have a pass. But not Apple. They act like it is all Apple's fault. They pick on Apple. It is not FAIR! Apple is a scapegoat. Everybody who owns any Apple anything is seen as a lesser person because of this stuff. A complete and total idiot. Well, I use Safari with Java disabled, AdBlock, and Click to Flash. I had been thinking of adding one of the NoScript extensions, but haven't gotten around to it yet. Unfortunately, I got suckered in by a Phishing attempt a few days ago (it's no longer safe to check your email before you're fully awake...) and am wondering what to do about it. Change all of the affected passwords. Close any credit card accounts that were compromised. If you gave your SS number, there is nothing that can be done about that. And I agree with a previous poster, Apple is the media's favorite whipping boy right now. Wallstreet's lapdog, the media, is being used to manipulate AAPL stock prices via fear and gloom. When they have driven it down low enough...the sharks will buy-up AAPL yet again...run a bunch of positive articles (PUMP)...followed by yet another DUMP when it gets to their target "high" value. Then they'll place puts on AAPL, run more gloom and doom stories, and make money on the way down too. And then you have Einhorn, the hedge fund "humanitarian" who simply wants to raid the APPL cash pile for his elite clients. It has already been proven that AAPL stock volatility was tied directly to hedge fund manipulation. Expect more...unfortunately. Wallstreet is just a steaming pile. sounds like js was included in the web page, possibly to load external code. Just read a report that suggests even after apple knew developers were at risk they did nothing to contact iphonedevsdk of the problem (I know its not their job to fix this but you really couldnt help them out?). This is just more evidence that Apple does not care about anyone but themselves. 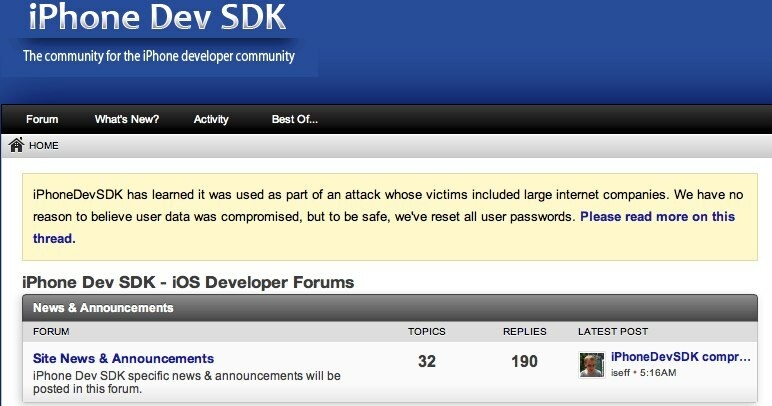 They defiantly dont care about developers this is just another sign.